We caught up with Phil Gallagher (aka Mister Maker). 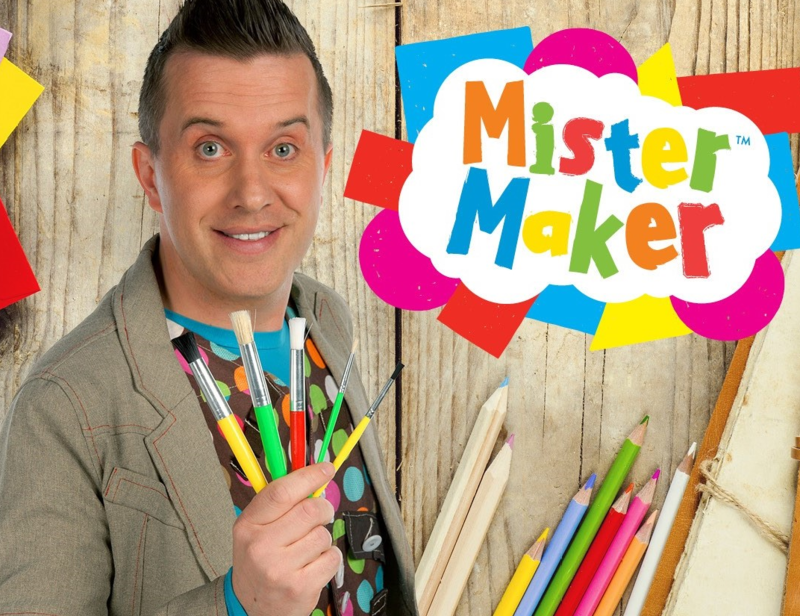 How did the Mister Maker character come about? Have you always been crafty? The idea of the character was to be able to teach exciting arty techniques whilst hopefully being entertaining and funny. I have always loved making things – from a very early age! I remember making fluffy bugs out of wool, cardboard and googly eyes with my Grandpa when I was very young. I’m proud to say we have a very loyal fan base around the world. The show is now played in over 100 countries. I have loved visiting all the countries I’ve been to and they all hold special memories for me. The favourite live show that I’ve done outside the UK so far was in Jakarta, Indonesia – over 10,000 wonderful people came to cheer me on and I will forever be grateful for the incredible reception that day. If you could be one item from your Doodle Drawer, what would it be and why? What are your top tips for getting crafty? Try to use recycled materials as much as you can – start saving old kitchen roll tubes, cereal packets, sponges etc. as these can be really useful. Gloopy glue, pencils, pens and paint are important too – along with scissors. But be careful, scissors are sharp! Remember, there are no right or wrong answers with art. It is just all about being creative and finding the fun in making something. What’s your favourite craft material in the Doodle Drawers? If you could make absolutely anything, what would it be and where would you make it? I would say my dream arty adventure would be a painty football splat picture made on the pitch at Wembley Stadium! If you were one of the Shapes, which shape would you be and why? Probably Rectangle as he’s the tallest! I love watching football! Spending time with family and friends is my favourite thing to do. For more information or to book tickets to his Sydney show, please visit the website.